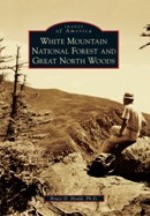 White Mountain National Forest and Great North Woods, by Bruce D. Heald, Ph. D., 2011. Part of Arcadia Publishing's popular "Images of America" series, this book presents an excellent compilation of vintage photos with extended captions from the early years of the White Mountain National Forest, which was authorized by the Weeks Act in 1911 and created in 1918. There are chapters on the Presidentials, the Great Gulf, the Great North Woods, Franconia Notch area, Sandwich Range, Crawford Notch, Pinkham Notch, plus additional sections on early 20th century logging, and recreation (hiking, camping, dogsledding, fishing, skiing). 128 pp., 6 1/2" x 9."